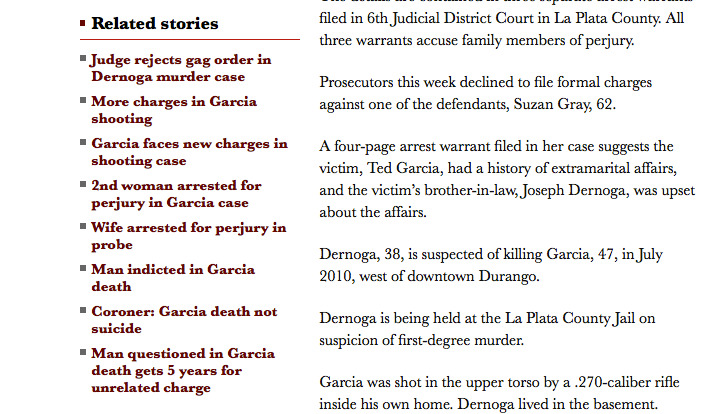 Adding maps to articles as well as a map of stories with location information can all be done in a few easy steps. 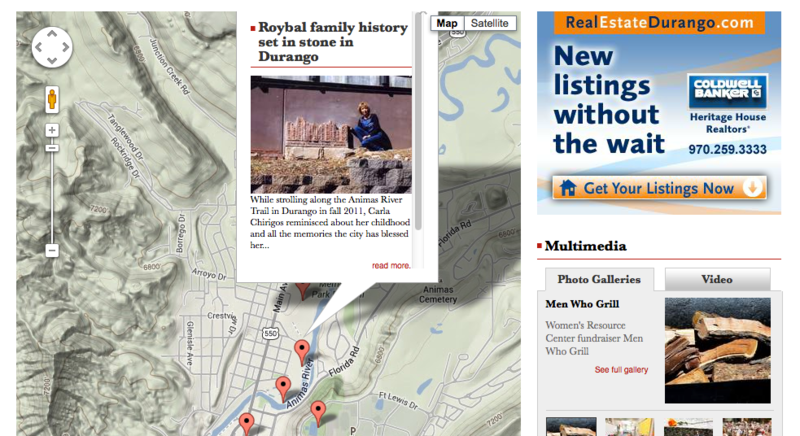 In a web browser, go to latlong.net and search for your location, or simply search Durango or Cortez Colorado to get you in the general area. Click on the map to identify a specific location, click the pin to display latitude and longitude and copy these coordinates. Go to the article properties in Saxotech Editorial and find the Geo-location area under the web properties tab for your article. Paste the latitude and longitude in the appropriate areas and add a ‘Label’ and ‘Data’ which will populate the map info windows. To add more points on the map, click add in the properties. 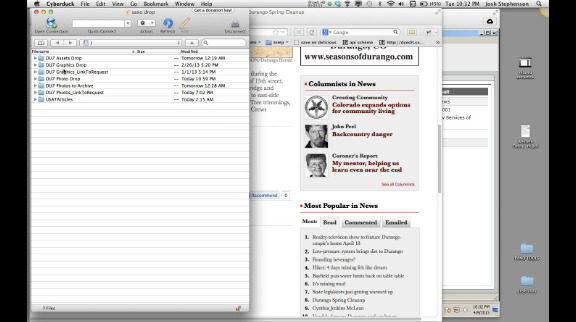 Adding related documents and PDF’s is a great way to quickly and easily add additional online content. Follow these simple steps. First, make sure you’re working with a pdf, word or excel document. Many times, things like maps are in fact image files. If what you have is an image, simply make sure it is a .jpg file and link it as you would any other photograph. Save the PDF or .doc file somewhere easily accessible on your computer. Name the file something that readers can see and make sense of. Open your Saxotech FTP connection and drop the file in the folder titled DU7 Assets Drop. 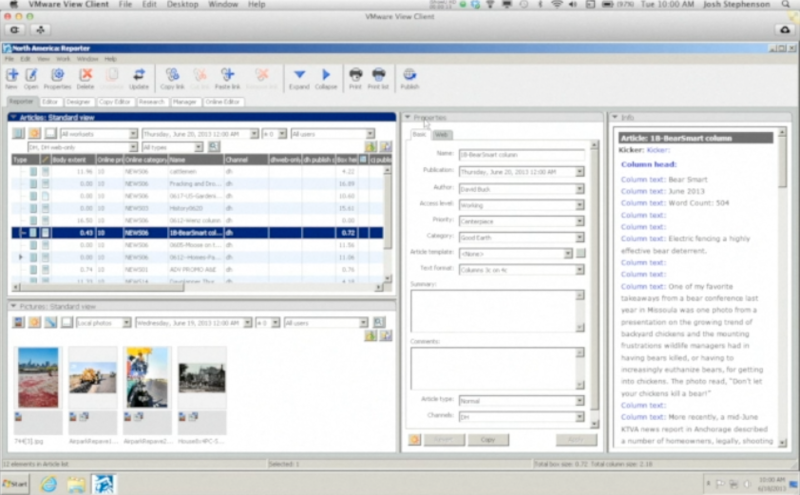 In the MWC, select assets for one of the modules and click the plus sign to create a new asset. In the new asset prompt, title the asset something that makes sense to readers (there is a character limit), browse and select the asset you uploaded where the “Path” field is displayed and make sure ‘copy to default asset folder’ is selected. Click Save. Without holding any other keys, click and drag the asset to the article. A few clicks will enable comments for online users. Select the article and open its properties. Go to the web properties tab and check comments. Select the article and click the edit button. In the main properties pane, select “on” in the “Forum” drop-down. 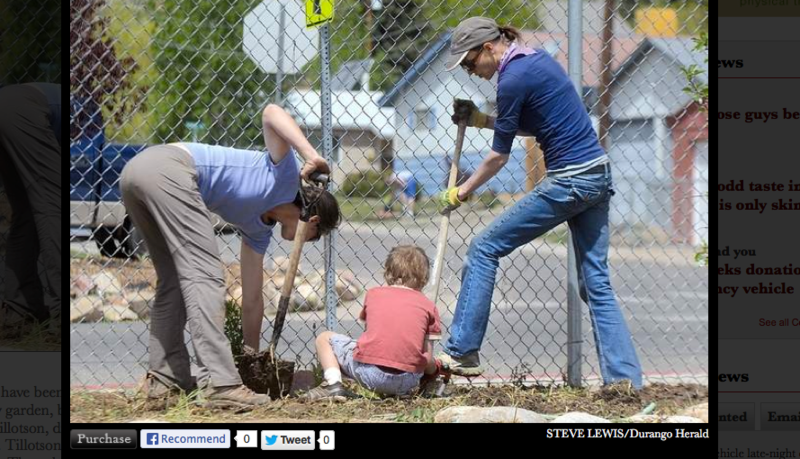 With the simple check of a box in article properties, readers will be given a link to purchase images online. 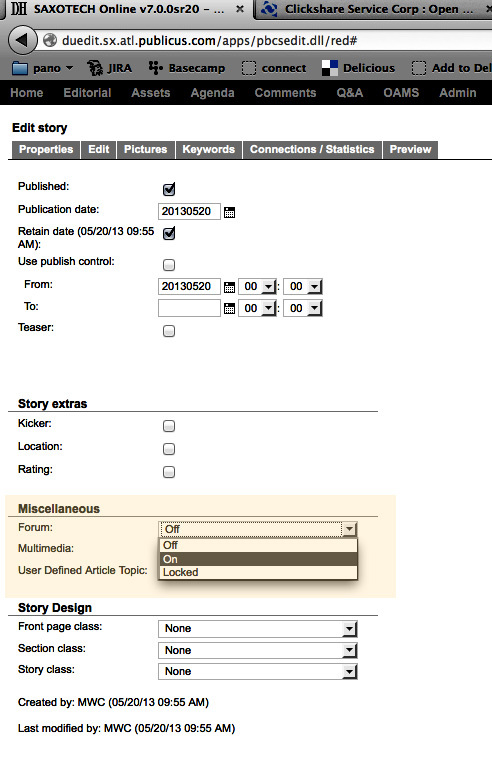 Click on the article, open the properties and in the web properties panel, check the box labeled image sales. If that step was not done, follow these steps to add the ability in the online edit interface. 2. – Go to the Edit tab and open the extra fields portion in the right rail. 3. – Change the word ‘False’ to “True” in the photosales area. 4. – Click save and close on the article and recache it. If an article has 3 or more images and additional sidebars and fact-boxes, changing article class will add a nice photo-gallery while keeping additional content high on the page. Here’s how. 3) Save and close the article and recache it manually. An account to upload videos in the Castfire system is required. If you need an account created, see the Photo/Video Manager. Click “Add Show” to upload your video, giving it a title and selecting the video channel in the media type in the ‘Channel’ drop down. Add or select a poster frame and add any keywords that match the content. Go to the Assets module and select File/Create New/URL Asset. In Castfire, go to the Profiles tab and copy the 768kbps m4v URL. In Saxotech, paste this URL in the new asset window URL field and give the asset a name. Go to the general properties tab for the new asset and select Castfire for Asset type, then click save. 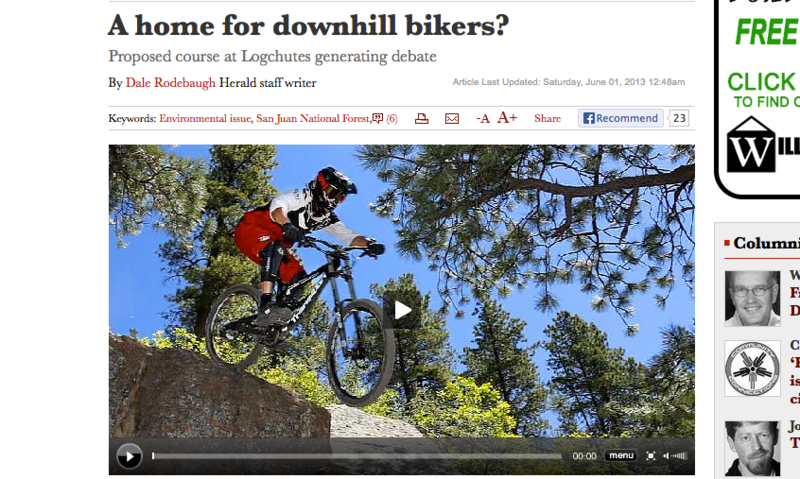 Without holding the ‘control’ key, click and drag the asset to the article. 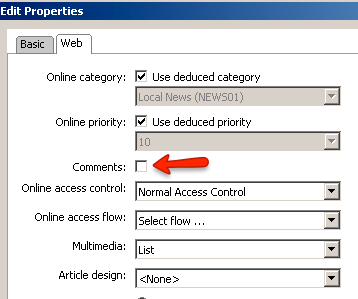 Select the article properties and make the following changes. 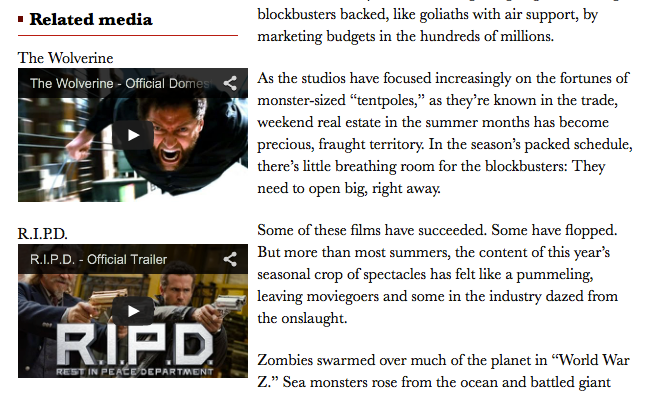 Go to the ‘Web’ tab and select ‘Embed Left’ in the ‘Multimedia’ field. NOTE: If the video is a standalone video, you must create an article with a headline and link either a photo or a teaser image. Click here to learn about linking teaser photos. The importance of priorities, 1 – 2 – 3 clicks away. 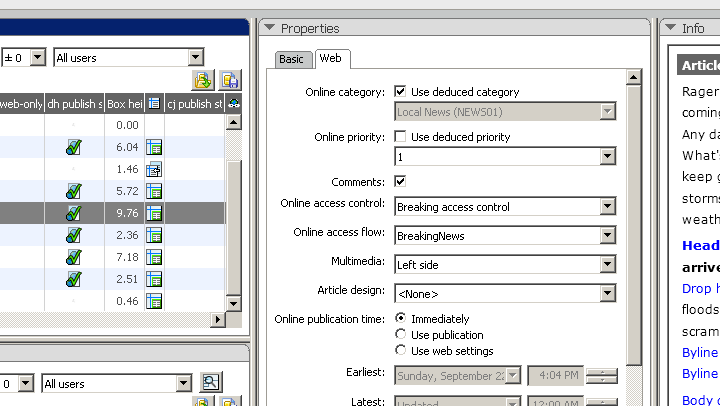 Select the article and open the Properties panel to the ‘Web’ tab. Click 2 – Select a number 1-10 in the drop down window. Click 3 – Click the apply button to confirm the changes.